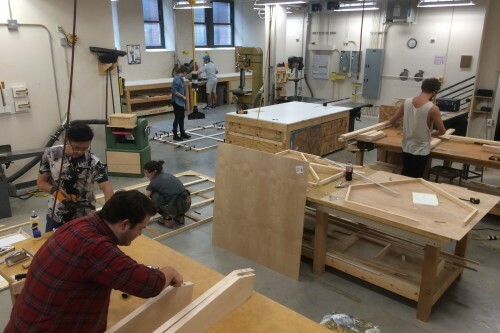 Also known as the "FLIV" Wood Shop, this studio is for use by all enrolled students and is staffed with a technician during all open hours to ensure safety and help with projects. The FLIV Wood Shop is equipped with two bandsaws, a table saw, miter saw, panel saw, jointer, planer, belt/disc sander and oscillating spindle sander, along with a variety of power tools and hand tools. For more information about the tools in the shop, check out our safety videos below!